In general, street art covers entire walls and sometimes even the buildings themselves. This incredible art transforms streets and alleys into an outdoor gallery, to the pleasure pf passing pedestrians. But one surface is often ignored: the stairs. When painted, public staircases are an astonishing and unexpected canvas for both portraits and more abstract art. It's as nice to climb them as it is to admire them from below, for different perceptions. This type of stair project is often done with the help of many people. For example, 16th Avenue Tiled Steps in San Francisco comes from a community effort. Ceramist Aileen Barr and mosaicist Colette Crutcher worked with about 300 volunteers for two and a half years to complete their project. And a group of artists called Dihzahyners made a project called Paint Up! 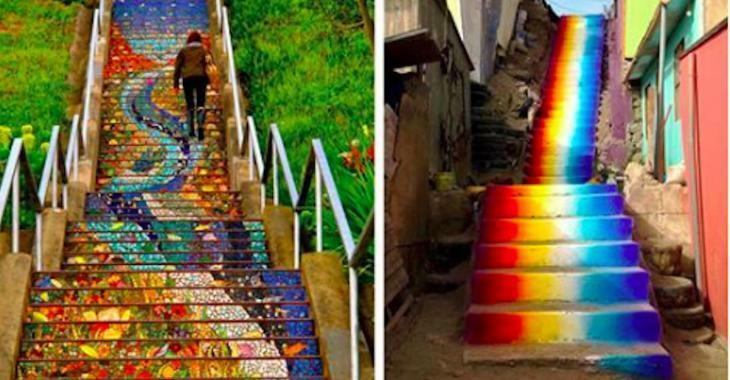 using their creativity to beautify the stairs in Beirut, Lebanon, step by step. For the pleasure of your eyes and to hopefully get you to want to travel there to see them in person, here are 19 spectacular works done on stairs! Admire them and tell us what are your favorites!